On May 16, 2017, Morristown Police Department (MPD) Officer Jonathan Helton responded to a pedestrian struck and ran over by a bus. Upon surveying the scene, the victim had life-threatening injuries to her lower extremities; including hemorrhaging. Officer Helton retrieved his hobble restraint, fashioning into a tourniquet to stop the bleeding on the victim’s lower extremities. Officer Helton was recommended to the MPD Awards Committee for the Life Saving Award due to his selfless efforts and quick action in this incident. The Life Saving Award is presented to personnel who, in the performance of their duty, physically rescues a person from the likelihood of certain death; or renders first aid of a distinguished or unusually creditable nature to a person whose life is in immediate jeopardy; or renders first aid in a manner that sustains the person and enables the person to be delivered alive to a medical facility. He was awarded the Life Saving Award at the Morristown Police Department’s Command Staff Meeting on September 5, 2017. 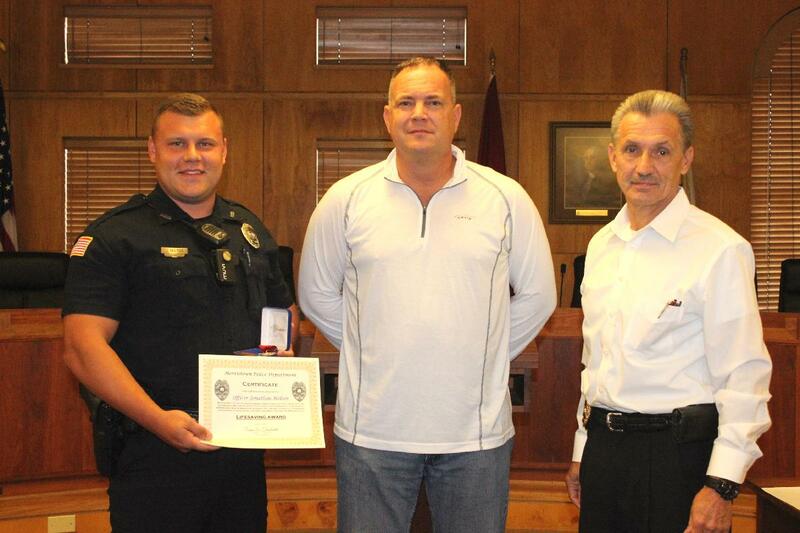 The award was presented by Chief Roger Overholt and Reserve Sergeant Andrew Slemp, who submitted the nomination. Officer Helton has served with the Morristown Police Department since November 2015. He has an Associates of Science in Criminal Justice from Walters State Community College.